Even though summer is my busy time at work, I try to leave room for a bit of adventure. 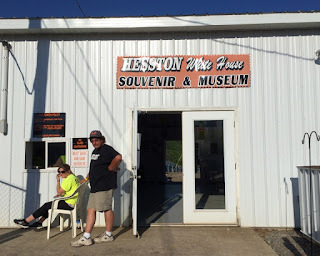 In June, I finally got the chance to go to Hesston Speedway, the dirt track that’s about an hour from State College. Rob, the bf of my old intern Karen, drives a sprint car in his spare time and was racing there. Karen offered me the chance to go. I said not just yes, but hell yes. Readers, you might want to sit down for this next part. It wasn’t even hot pants night. I’ve been to lots of low end events, but this ranks among the lowest. For starters, it’s really, really, rural. When you roll down the window of your car on the way into the place you hear the opening bars of the theme from Deliverance. When political pundits talk about the part of Pennsylvania between Philadelphia and Pittsburgh being Alabama, Hesston Speedway is exactly what they’re talking about. The parking lot, buildings, and track itself look as if they cost about ninety-eight cents to build. If you can build a speedway without a plan, let alone plans, permits, and so on, this would be it. 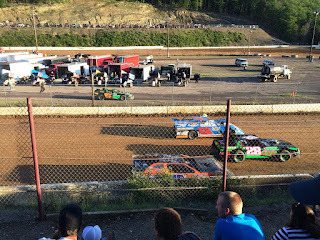 It’s a short dirt track and by dirt, I mean the kind of dirt that gets into your order of French Fries about a nanosecond after you pick them at the concession stand. 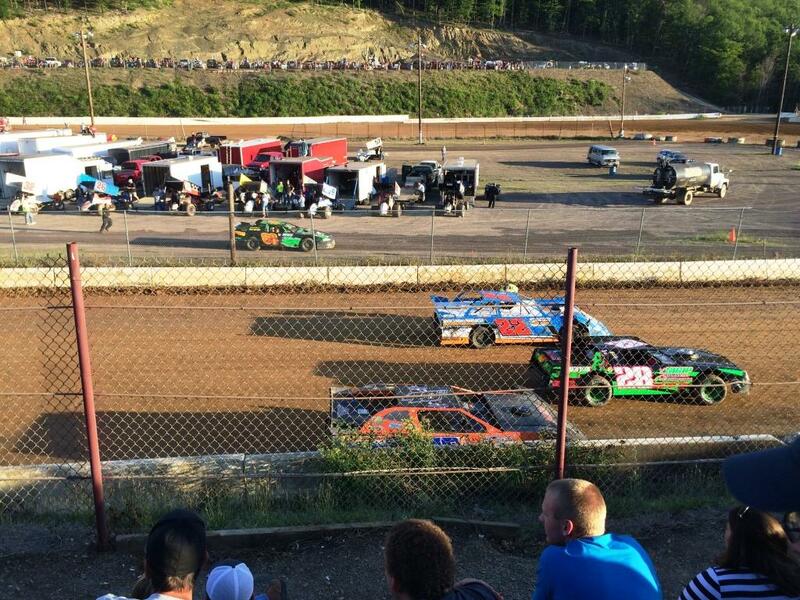 They race a few different kinds of cars; sprint cars, some other class that look like stock cars that have been stepped on by a giant, and cars that look like Chevrolet Monte Carlos that belonged to the Hatfields and McCoys. The drivers race hard; while the place is low end, there’s plenty of excitement. After it was dark, the announcer--who has an accent you have to hear to believe--asked the folks parked on the far side of the track to turn on their flashers so that the blinking lights would remind us of, I dunno, fireflies, or perhaps of people parked on the opposite side of a much nicer racetrack. That was crazy. The best part of this selfie is the guy sitting behind us. Of course, Karen and I had a great time, and might have had more fun than Rob, whose race for glory was cut short by a flat tire in the second big event of the night...the first big event being that woman ahead of me in line at the snack bar. Especially if it were hot pants night. And then there was the Arts Festival, where I celebrated the tenth anniversary of being run over by not getting run over. The following weekend I drove to Ohio to help a friend recycle some furniture by bringing it back to Happy Valley. The worst part of the trip was spending the night in a Hampton Inn that smelled like the inside of a sneaker. The best part, other than quality time with an old friend, was that no furniture fell out of the truck; something that’s actually happened to me before. Do these guys look as if they’re having fun at the Jersey shore or what? My guess is that at least two of the guys were avid fans of The Jack LaLanne Show. 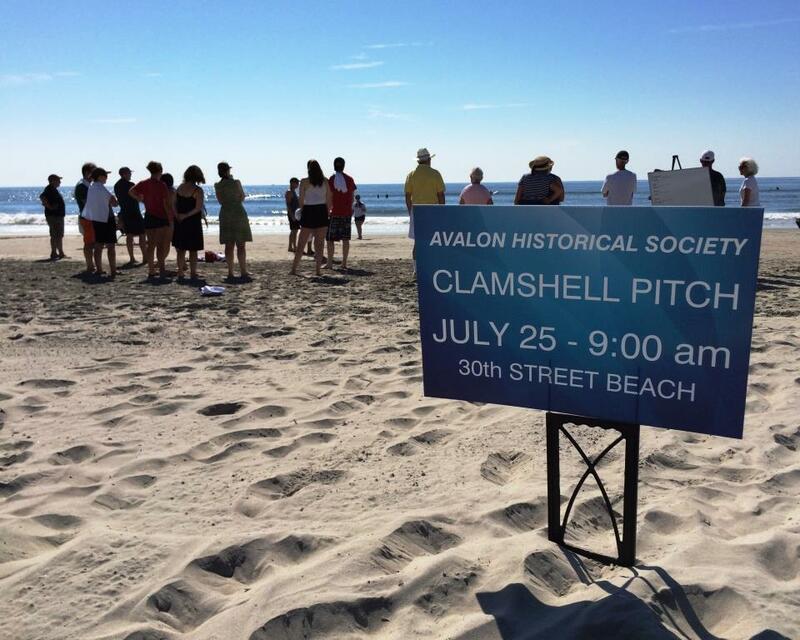 What did I know about clamshell pitching? Absolutely nothing. I wasn’t even sure it was safe to do in a month with no R.
Soon enough I learned that the premise of the game was simple: you toss a clamshell, from which the actual clam is long gone, into a hole in the sand. You do it on the beach, below the high tide line when the tide is out, so that you have a hard surface of sand on which to play. I suppose you could do it in other locales, but I think it would lose something (and it doesn’t have much to start with) in the translation. My compadres Bruce, Martha, and Pam and I were game for this historical adventure and so we drove up to the Avalon Community Building to be there at 9:00 a.m. sharp. We parked, crossed the dunes and walked onto the beach. We passed the beach Crossfit class and then a beach yoga class (think downward facing beached whale) and walked towards a gaggle of presumed clamshell pitchers milling around at an E-Z Up, the universal symbol of someone who doesn’t want to buy a decent tent. There weren’t nearly as many people there as I expected. Apparently there’s a limited market for clamshell pitching, a condition exacerbated by the Avalon Historical Society's terrible-slash-non-existant marketing. We made our way to the registration table, all set to sign up. 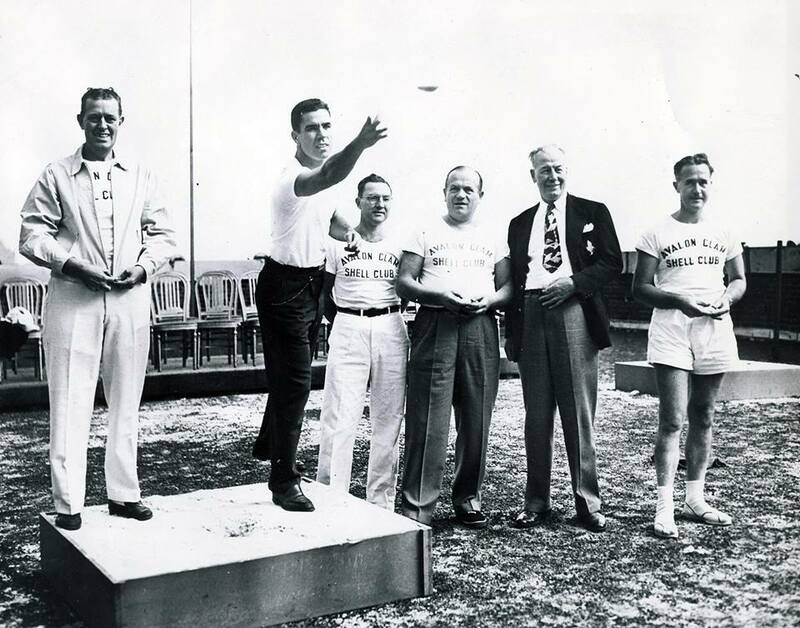 We were eager to do our part for local history and a sport where having been picked last in gym class might not actually be an impediment to success. After I’d signed on the dotted line and was ready to pay, I learned that you needed to have actual cash or a check to register, a fact that the organizers failed to mention ahead of time. Apparently processing a credit card with a gizmo on a cell phone, or battery-powered terminal, or an old-fashioned knuckle-buster, or even writing the credit card number down on a piece of paper for processing back at the office was not in the cards. Did I miss the fine print that said the event was being put on by Amish? Fortunately Bruce had a wad of cash so we were able to sign up and get our free ($15) unattractive even by New Jersey standards tee shirt. We had to decide if we wanted to play singles or doubles, and we opted for mixed doubles. Bruce and Martha made up one team and Pam and I the other. The organizers also failed to make clear that registration opened at 9:00 but the actual event didn’t start until 9:30. So we had plenty of time to do more milling around, or if you prefer the technical term, flogging one’s yo-yo. 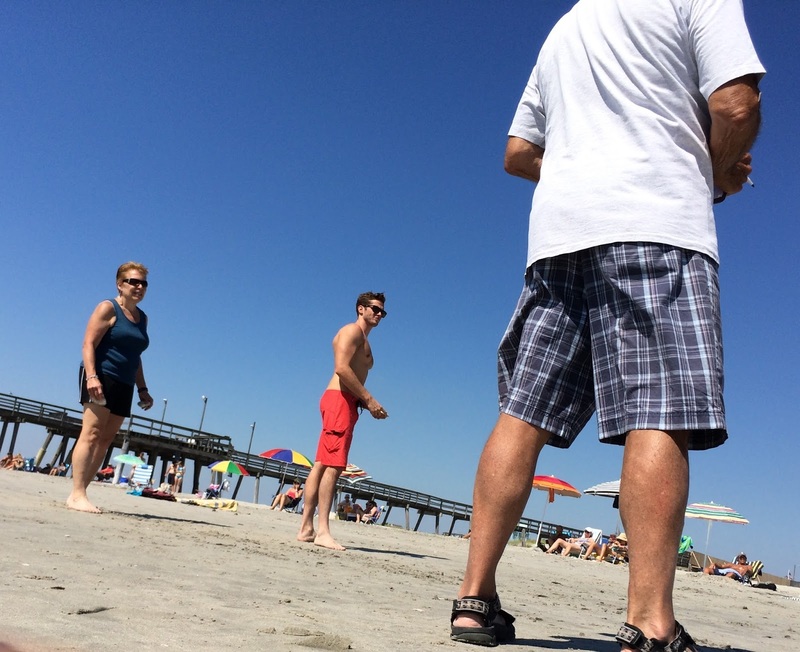 During the yo-yo flogging, someone pointed out two holes in the sand, seemingly the “regulation” 25 feet apart. There was a plastic milk carton filled with clamshells at the ready. Several of us took the time to practice. It was then I discovered that there was a good reason that clams don’t fly—in addition to lack of wings, feathers, or even the ability to put their tray table in an upright and locked position for takeoff and landing. It was because they have the aerodynamic qualities of a clamshell. As in…none. The beach is a breezy place, and as my clamshells went hither, thither, and yon, I thought to myself, “What ho! Now I know how Jordan Spieth must have felt at St. Andrews!” Less the white trousers and kazillion dollar Under Armor endorsement deal, I mean. I wondered if the AHS people were expecting the crowd to grow, but when 9:30 came and went it was apparent that clamshell pitching isn’t quite as popular as going to a gallery opening to see Jane Seymour, her VPL, and what passes for her painting, or riding around on the island jitney from bar to bar with a bunch of over sunned, over served, and over sexed weekending twentysomethings. The good news was that there was a diversity of ages there. There were some old geezers and some middle geezers (as in people our age) too. Amazingly there were perhaps ten young and mostly (ok, somewhat) attractive people, all of whom seemed to work at Jack’s Place, a bar in Avalon that caters to the college crowd. I’ve never actually been there, but have driven by a million times and each time I do, I think to myself…”Jack’s Place….I wonder if Jack’s off tonight?” And I chuckle to myself each and every time. 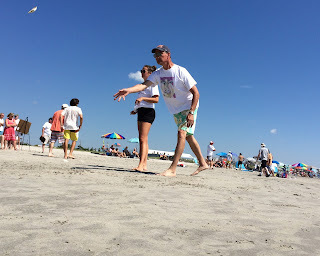 After more yo-yo flogging, someone had the bright idea to add a second court and out came what appeared to be a rusty Chase and Sanborn coffee can for the purpose of digging the hole in the sand. The AHS opened up what golfers would call the back nine. After an extraordinarily poor showing of teacher voice on the part of the “organizers”—and I use the term loosely—the first guys were called up for their singles matches. They stood about behind their Chase and Sanborn-made holes in the sand, 25 feet apart, rather like Alexander Hamilton and Aaron Burr wearing not knee breeches but Lands End swim trunks and armed with clamshells instead of dueling pistols. Each player had two clamshells to toss, and the players were to alternate throws, first player A, then player B, and back to player A and then Player B. The guy with the clamshell closest to the hole got one point. If he got the clamshell in the hole that was two points; and if he tossed the clamshell in the hole on top of the other player’s shell, he got four points. At least that’s how I think the scoring worked. I’m not sure all of the historical judges used the same historical scoring system. After the first two players tossed their shells, a clipboard toting historical judge, who I believe was old enough to be the first European settler in New Jersey, got out a tape measure and proceeded to measure the distance from clamshells to the hole to aerospace industry tolerances. This took until at least Tuesday. At this point I realized we might be there until after Labor Day and I uttered my first “Kill me now” of the day. While they were playing, the pitch honchos tried to set up a bracket on whiteboard, presumably to spur office pools and betting action. This was made somewhat difficult since they couldn't actually spell all the contestants' names. I thought about making an emergency call to the NCAA but decided to let the shells fall where they may. After some time, presumably overhearing my grumbling, and after an Avalon beach tag inspector walked by wondering “WTF?” the folks in charge decided to open a new course so that more people could play simultaneously. It think I heard someone say that there was a shortage of historical judges, though everyone was perfectly capable of keeping score themselves. It couldn’t have been a space issue—the beach is seven miles long after all. Bruce and Martha were in the first game on the new pitch, and went down in a blaze of clam juice against a couple of the twentysomethings including a shirtless bear from Jack’s Place (“I wonder if Jack’s off tonight?”). Pam and I were called up to played against Tom and MaryBeth. Tom’s claim to fame was that he was handsome and had a great body. MaryBeth was hungover, not at all chatty, and seemed to be there only because Tom was there; in and of itself, not a bad idea. Tom had some sort of job in IT, but also worked at Jack’s Place ("I wonder if Jack’s off tonight?”). He wore red board shorts that were much too long. Seriously, the Speedo was invented with this guy’s body in mind. 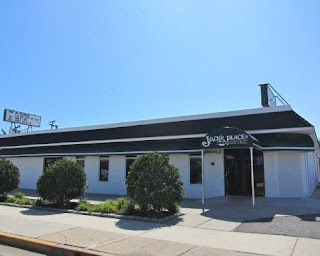 No matter what he made at Jack’s Place (“I wonder if Jack’s off tonight?”) he would have made WAY more at The Blue Moon in Rehoboth being objectified and overtipped by gay men. He might even have realized that he could have done better than hungover MaryBeth and learned something about window treatments in the process. It may come as a surprise to regular readers, but I do know my way around certain clams, and I kept team Rick and Pam in the contest, if I do say so myself. Even so, we did not make it to the second round. Although at one point we had a five shell lead, MaryBeth, sensing that Tom was considering the Blue Moon option, brought on her A-game late in the match and we were done for. We didn’t bring home the suitable-for-hanging-in-the-garage clamshell plaque. And really, that’s probably OK. I got an incredibly unattractive t-shirt that I cherished briefly instead. I suppose that it’s an occupational hazard that someone who organizes an event for living goes to his share of crappy events. This was the worst tourist experience since the Las Vegas Mob Tour, something that was so horrible that it’s in a class by itself. The 6th Annual W. Norman Mackey Clamshell Pitch could have been amusing but instead it was like going to a beer party where they ran out of beer five minutes after you got here, and instead of beer, they gave you a calculus exam. When it's time for the 7th Annual W. Norman Mackey Clamshell Pitch, I'm washing my hair. In order to get the taste of that out of our mouths, Bruce and I drove over to North Wildwood to take in an antique car show on the Boardwalk. North Wildwood is just over the Hereford Inlet Bridge—toll, $1.50, E-Z Pass not accepted—from Stone Harbor, but it’s quite different from its smart and upscale neighbor. Although Wildwood (technically The Wildwoods—North Wildwood, Wildwood, and Wildwood Crest) is making great strides to rebrand itself as the epitome of 1950s doo-wopness, I still tend to think of it as Altoona-by-the-Sea. 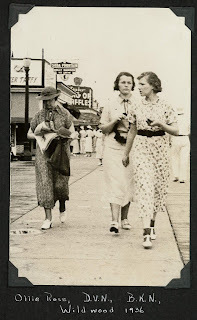 That's my mother, on the far right, with her older sister Doris in the middle, and their cousin Ollie on the Boardwalk in Wildwood, 1936. 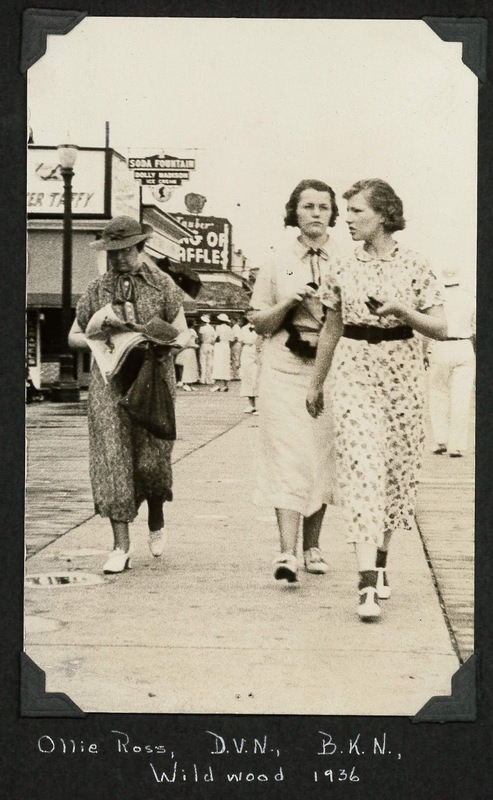 My mother told me that even in the 1930s, Wildwood was “pretty rough”. 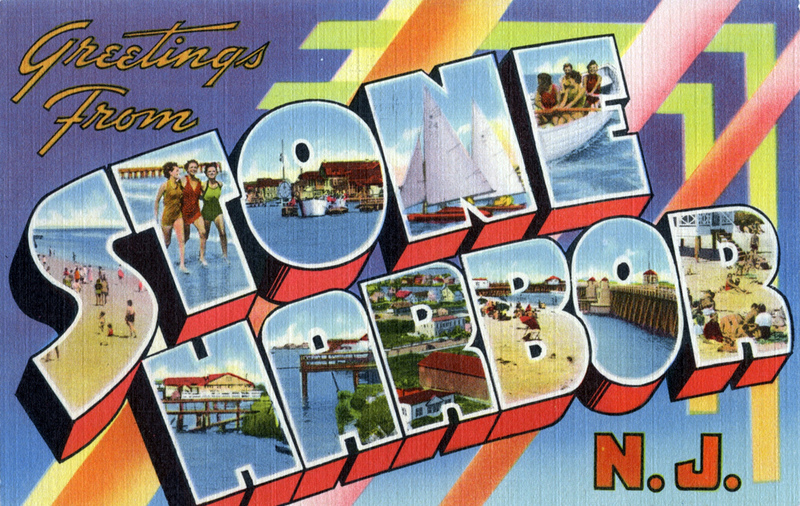 Young hipsters might prefer it because it’s “more diverse”, but as someone accustomed to Stone Harbor, which actually has a shoppe devoted to Lilly Pulitzer togs, it’s like a Diane Arbus photo come to life. There were about 35 cars in the show, the oldest being a pair of boring old Ford Model A's. Interestingly enough, there was a 1976 Cadillac Eldorado Convertible, a car my mother had. Gosh, what a land yacht that thing was! It reminded me that she called my grandfather’s even larger Cadillac sedan, the Queen Mary, after the Cunard liner. To me, the most interesting car was an Edsel built for the Canadian market. I had no idea that American cars made for the Canadian market cars weren’t the same as American cars made for the American market, but there you have it. And the differences went beyond the two choices for upholstery: plaid or the Hudson’s Bay Blanket. The owner’s manual was written in more polite English and it had a do-hickey where you could plug your dipstick into a heater during the 11½ months of winter in Canada. 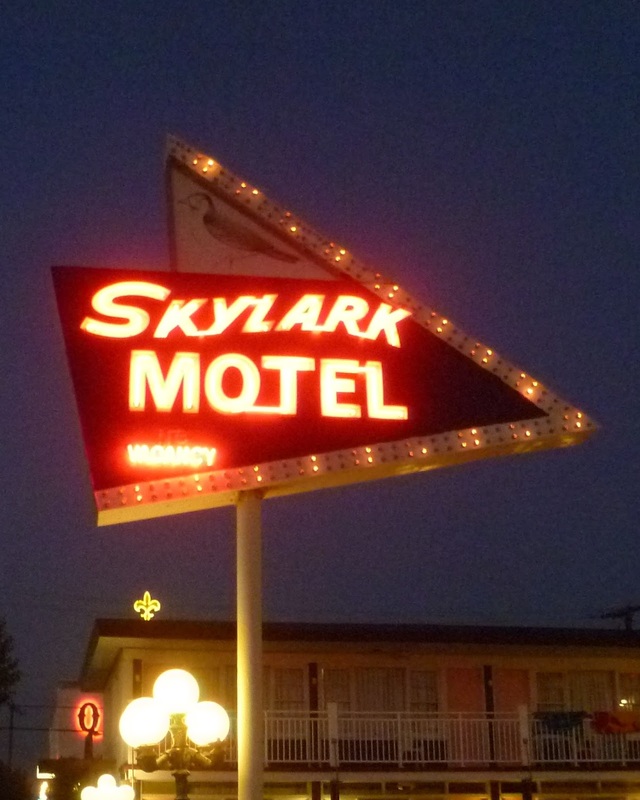 Even with cool cars, Wildwood is still Wildwood, and after an hour of checking out tail lights, radiator ornaments, and carburetors in addition to the tats, bad makeup, and an Easter parade worth of Glamour don’ts, we headed home. I gave Bruce a knowing look and assured the clerk that I wouldn’t. 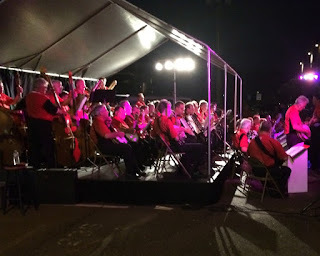 Bruce went home early, but Pam and I stopped to enjoy Philadelphia’s Ferko String Band which was in concert in the parking lot of the Stone Harbor Water Works. We missed the first half of the show, so when we got there, the light was fading and some in the assembled crowd had obviously enjoyed the offerings of the adult beverage stations and perhaps even a flask of Geritol or two. Apparently drinking on municipal property in the shadow of the town water tower is A-OK in NJ. Pam and I settled into a prime standing room spot behind Stone Harbor's leading citizen, Sister James, the force of nature who keeps Villa-Maria-by-the-Sea in tip top shape. I was totally clueless about the band until the emcee reminded the audience that The Ferko String Band performs in Philadelphia’s Mummer’s Parade each year and will be at the Stone Harbor Christmas Parade this year. Mummers, I don’t understand. I suppose they’re like a krewe in New Orleans or those troops of guys who dress up like the Cisco Kid in the Rose Parade. Mummers wear crazy costumes and have bands with accordions and banjos and what not and have a special dance, the Mummers' strut. As a fan of the "more diverse" Wildwood would say, they're totally whack. Liquored up old folks--twentysomethings were conspicuous in their abscence--were bobbing their heads and tapping their feet to string band standards like Waitin' for the Robert E. Lee and Alabama Jubilee. Three band members, decked out from head to toe in their New Year's regalia did the famous Mummers' strut as the band played a tune called Hindustan. It was kitschy, joyous, and hilarious. The crowd loved it. When the band got to the finale and the Mummers' signature tune, Oh, Dem Golden Slippers, the audience bolted from their aluminum lawn chairs to dance. You have not seen moves until you've seen a retired nun do the Mummers' strut. I’d expected the clamshell toss to be the highlight of my day. Wrong! Instead, it was a gaggle of retired nuns doing the Mummers' strut under the Stone Harbor water tower. I wonder if the kids from Jack’s Place ("I wonder if Jack’s off tonight?") know what they are missing?